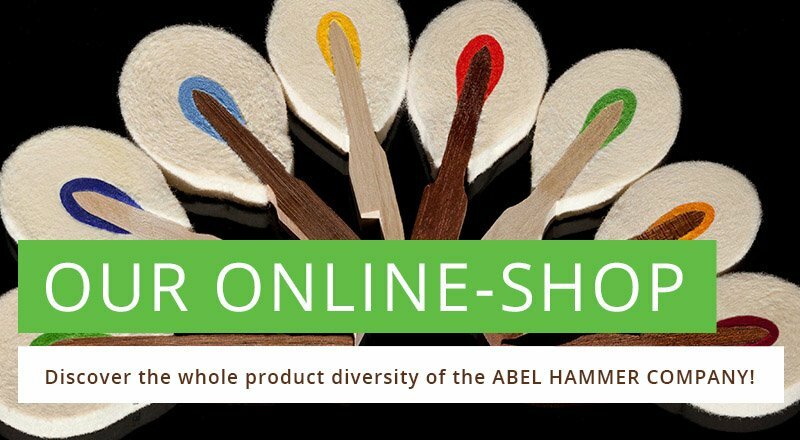 Discover the whole product diversity of the ABEL HAMMER COMPANY! We manufacture hammer heads in large varieties for pianos of all kinds, from square pianos to concert grands. Our customer service will gladly help you! The ABEL HAMMER COMPANY manufactures quality piano hammerheads and shanks and flanges in our 1200m² modern production plant in Frankenhardt, Germany. Our fine products are produced with technical expertise by a highly motivated team under the leadership of our technical managing director Frank Abel and the CEO Norbert Abel. The wide range of standard hammer heads and shanks is not all that the ABEL HAMMER COMPANY has to offer. Our many years of experience are invaluable for the repair and restoration of hammer heads and hammer shanks of historical pianos and grand pianos from famous manufacturers. If you can provide a sample of the original, we also produce high quality hammer heads and hammer shanks of instruments which are not available any more in the original shape. We manufacture hammer heads in large varieties for pianos of all kinds, from square pianos to concert grands. Original, historical pieces entrusted to us are handled with particular care so that these original pieces return to our customers in the same condition as we received them.